How to Start Watching WWE: Spring Edition – AiPT! There’s never a bad time to get into pro wrestling. Sure, there are the weeks months years times when the product is less than stellar, but such is the nature of all serialized fiction. And like comic books, you can’t conceivably start from the beginning and work your way through every individual match, episode, and pay-per-view without going mad. Luckily, if you’re just starting to watch WWE for the first time or picking it up after a lengthy absence, you couldn’t have picked a better time to do so. First, WrestleMania is a little over a month old, meaning most storylines have ended and the WWE is theoretically on the start of its “next season.” Second, there are big changes going on in the WWE, including the addition of new wrestlers and a bigger spotlight on women’s wrestling. Storylines are outlined/scripted and outcomes are predetermined, but wrestling is by no means “fake.” Sure, legs are slapped and mats are stomped to create sound effects of sorts and amplify punches, but there are no wires for the gravity-defying flips and injuries do happen. (A sizable percentage of the WWE roster is currently on the bench). Matches are usually won by pin or submission. The wrestler has to have their opponent pinned to the mat for three seconds, or the opponent has to give up and “tap out” in submission. If a wrestler is attacked by a party outside the match, they win by disqualification. There are many other match stipulations and variations that can be won or lost in different ways, but we won’t get into that just yet. There are several wrestling championships (or titles), which drive the main storylines in the WWE. The WWE World Heavyweight Championship is the top prize for male wrestlers in the WWE, as is the WWE Women’s Championship for the women’s division. The Intercontinental Championship and United States title are lower-tier titles, but still hold major significance and take a decent amount of TV time each week. WWE has the Tag Team Championships as well for tag-team wrestling, which involves two wrestlers wrestling against another pair of wrestlers, with one man in the ring at a time. This is also of great import. Shows like Raw and Smackdown are formatted to build anticipation and interest in pay-per-view/live special events. Title changes rarely take place on WWE’s weekly shows, Raw (Mondays at 8 Eastern) and Smackdown (Thursdays at 8 Eastern), and you’re more likely to see matches on TV end in a false finish or disqualification just to further the story line until a PPV event. They’re still incredible to watch, and well worth your time. NXT is the minor leagues of WWE, but is just as entertaining as the main product, if not more so. WWE always had a place where it sent wrestlers to train themselves on the mic and in the ring in front of a small audience. In the last few years, however, the company’s developmental system, NXT, gained tremendous exposure by broadcasting over the WWE Network video streaming platform. Viewers get to see wrestlers before they make it on the main WWE stage as they battle for the NXT Championship, NXT Women’s Championship, and NXT Tag Team Championship, among other things. Due to how the program is produced and formatted (one hour a week versus Raw’s three hours a week), it is often thought to be of a superior quality and more akin to independent wrestling. Pro wrestling exists outside of the WWE. Companies like Ring of Honor and Total Nonstop Action put on a weekly television show, and New Japan Pro Wrestling broadcasts frequent pay-per-view events. There are hundreds more smaller wrestling organizations around the world, to the point where one likely exists within a 100-mile radius from your home. I’m just not as familiar with all of this as I am with WWE, is all. Now that you’re familiar with the pro wrestling basics, it’s time to get caught up on the current storylines, or “programs,” in the WWE. You’ve heard of the Rock. 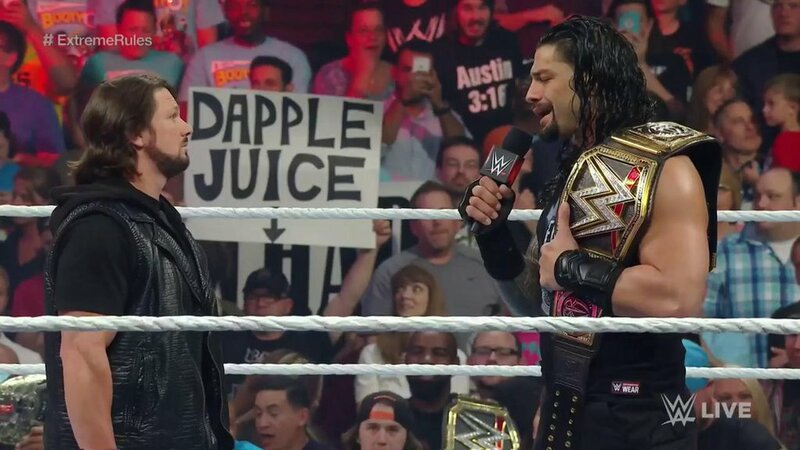 Well, Roman Reigns is the Rock’s real-life cousin. WWE trained him from the start of his career, and did everything and anything to make him one of the top stars on the roster. This, however, was not received well by the existing core fanbase, and he has been struggling to wow the crowd, even after winning the WWE Championship at WrestleMania 32. AJ Styles worked in TNA, a competing wrestling organization, for a decade. After abruptly leaving that company, he went on to wrestle in New Japan Pro Wrestling for a couple of years and became one of the biggest wrestlers to never wrestle in the WWE. WWE took notice of this and signed him to the company earlier this year. They also signed fellow NJPW wrestlers and AJ’s Bullet Club buddies, Karl Anderson and Luke Gallows. At Payback, the most recent WWE pay-per-view, Roman Reigns and AJ Styles fought for the WWE Championship. After some interference from both Gallows and Anderson and Reigns’ other cousins, the Usos, on-screen authority figures Shane and Stephanie McMahon changed the match rules and restarted the fight. Roman Reigns still won. Now, the rivalry between The Club (Styles, Gallows, and Anderson) and The Bloodline (Reigns and the Usos) has intensified, with Styles attacking Reigns and vice versa. The two are set to fight each other this coming Sunday at Extreme Rules in an Extreme Rules match (duh! ), where weapons, interference, and other underhanded tactics are perfectly legal. As the main event, it should definitely be a major highlight of the show. Women’s wrestling was never taken too seriously in the WWE until recently. While female competitors still aren’t featured on WWE television nearly as much as their male counterparts, the current women’s division is a huge step up from only a few months ago, when women were referred to as “Divas” and fought over a butterfly-shaped belt. Charlotte is the daughter of the legendary Ric Flair, one of the greatest wrestlers alive. Natalya is the daughter of Jim “The Anvil” Neidhardt, a notable wrestler and relative to legendary Canadian wrestler Bret “Hitman” Hart. Charlotte is the inaugural Women’s Champion, having won the belt at WrestleMania in April. However, in each of her title fights, Charlotte’s father Ric accompanied her at ringside and distracted her opponents, letting his daughter win using less-than-legal means. At Extreme Rules, Ric is not only banned from ringside, but any hint of his presence will cause Charlotte to forfeit the title to Natalya. Additionally, the winner of this match has to make their opponent submit, and cannot win by pinfall as per usual. These stipulations should make for an exciting culmination to a months-long rivalry. Chris Jericho is a cocky Canadian wrestler with a storied championship history in the WWE and elsewhere. Dean Ambrose is a crazy man known to use chairs, crowbars, and potted plants to fight against his opponents. Though they only recently started their rivalry, the two will face each other at Extreme Rules in an Asylum match — a steel cage with weapons on top of it that are used for the express purpose of hitting one another. These combustable elements and Ambrose’s penchant for performing risky stunts will push the boundaries of the show’s TV-PG rating and leave both men legitimately battered and bruised. The Miz first gained notoriety after starring on MTV’s The Real World. He then trained to become a wrestler, joined the WWE, fought in the main event of many pay-per-views (including WrestleMania), and worked with numerous wrestlers in singles and tag-team competition. Now, he’s the Intercontinental Champion, and his wrestler wife, Maryse, accompanies him to his matches. His persona in the WWE is one of an egotistical movie star, and he plays the part well. Sami Zayn, Kevin Owens, and Cesaro were all successful on the indie wrestling scene in the last decade, and are all fan favorites. Owens and Zayn, in particular, have a storied rivalry that dates back to the mid-2000s, and continued when they both competed in NXT. Cesaro struggled to gain traction in the WWE at first, but is now thriving as a popular James Bond-like character who comes to the ring in a tear-away suit. All four men will compete this weekend in a fatal four-way match, where only one of the participants has to pin or submit another wrestler in order to win. Since three of the four wrestlers are known for their industry-leading technical prowess in the ring, this match might be the best example of pure pro wrestling for newcomers, as opposed to the more spectacle- and “entertainment-based” wrestlers like, say, John Cena. The New Day made headlines outside of wrestling with their hilarious antics, which include wearing bright, colorful gear, dressing up as Dragonball Z characters, and making references to numerous internet memes, just to name a few. They are three wrestlers who were not doing much in the company when they formed, only to surge in popularity and become one of the biggest acts on the roster. The Vaudevillains are a new addition to the WWE roster. Their schtick is that of two men who practice the ways of a “bygone era,” namely old-timey wrestling and everything pertaining to. Though fans expected them to flounder on the main roster after coming up from NXT, they’ve proven to be successful as villains with viewers and the crowd. Another new tag team, Enzo Amore and Colin Cassady, previously fought the Vaudevillains at Payback to secure the number one contender slot against The New Day. That match was sadly stopped due to Amore suffering a legitimate injury. Thus, The Vaudevillains moved forward with a rivalry against The New Day, attacking them after their matches and taunting them with the threat of taking their title. The two teams will finally compete against each other this Sunday. WWE’s Raw and Smackdown programs air at 8 p.m. Eastern every week on the USA Network on Monday and Thursday, respectively. NXT airs every Wednesday on the WWE Network, a streaming network available for $9.99 a month. WWE pay-per-views and NXT TakeOver events are included in the WWE subscription. Given the fact that individual pay-per-view events are around $60 each through your cable provider, the WWE Network option is your best bet, especially since the first month is free. Now that you’re more acquainted with the WWE and pro wrestling in general, you should be able to follow this Sunday’s Extreme Rules event with relative ease. If you don’t recognize a character, or an element to the program seems unfamiliar, fear not. New characters and storylines are added all the time to WWE’s programming without warning, and longstanding rivalries and wrestlers inexplicably disappear often for no clear reason. After all, wrestling wouldn’t be wrestling without its share of surprises.